We have discussed at length the many benefits technology has brought to the modern era of golf. Yet with all the technological advancement, it can be difficult to determine which is best for your game. Determining which wedges to use is one decision many golfers get wrong. In fact, due to the constant strengthening (reducing the amount) of lofts on today’s irons, it is highly recommended that golfers carry multiple wedges in their bags. But if you carry three wedges, you also carry the potential to triple the normal confusion. 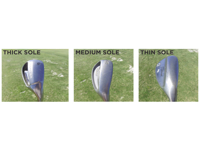 Four of the most important wedge factors are: bounce, sole width, loft and heel grind. Wedges come in many shapes, sizes and even more importantly bounce angle. 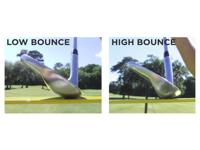 The amount of bounce on a wedge has a tremendous effect on how well, or not so well, you can utilize the club to your benefit. The many bounce options on today’s sand wedges range from 4-16 degrees, and choosing the proper one could be the difference in hitting it close or missing the green. Bounce was developed to bounce the club off/out of turf/sand and keep it from digging. As the leading edge enters the ground, the lower trailing edge “bounces” the club out of the ground and into an upward path. If a club has a high bounce (12-16 degrees) it is most effective out of soft sand and thick rough. If a club has a low bounce (4-10 degrees) it is most effective out of firm sand and tight fairways or fringe. Attempting to use a high bounce wedge off a closely mown fairway or firm sand will result in a shot hit thin, typically in the belly of the ball, and the ball traveling twice as far as desired. Use a low bounce wedge in soft sand or lush rough and the club digs too much, resulting in a ‘fat’ shot. Either way, it is important to have the amount of bounce on your wedge fit to both your specific swing and the type of conditions in which you play. Sole width is often confused with bounce. A club can have a wide sole but limited bounce and vice versa. Some teachers theorize that a wider sole will allow you to get the ball into the air easier. However, if the sole is too wide it could have an adverse effect. This is particularly true for those of you who play a golf course with firm conditions on a regular basis. The wider sole allows fewer margins for error, and if you are just slightly off, your chances to hit the ball the way you want are limited. Today’s wedges have plenty of loft and enough weight distributed throughout the head that a wide sole is not needed as much as it was 25-30 years ago. You will be much better off utilizing a medium to narrow sole, then matching the bounce to the conditions you play in as well as to the way you swing. There are 4 degrees of loft difference between each iron in your set, and it is highly recommended to keep that same difference between your wedges. If your PW is 48 degrees, it would be wise to have a Gap Wedge at 52 degrees, a SW at 56 degrees and a LW at 60 degrees. If you have a new set of golf clubs, chances are their lofts are stronger and your PW is likely to be 46 degrees. In that case, it is recommended your Gap Wedge be 50 degrees, your SW-54 degrees and your LW-58 degrees. Attempting to have more than 4 degrees between your wedges creates too much of a distance gap. Golf is a difficult game and consistency is critical in all phases from set-up to swing. Likewise, keeping a consistent separation in lofts through your set gives you an opportunity to improve instead of inhibiting that opportunity. This is the least known of the four topics and typically the one that confuses golfers, teachers and club fitters alike. 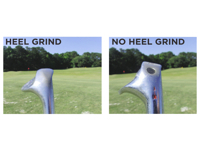 Heel grind refers to how much mass is at the base of the club on the heel. Most of today’s clubs have too much mass, which causes something known as heel drag through impact. Heel drag refers to the amount of resistance the heel of the club gets when contacting the ground, whether it allows the golfer to easily get through impact into his/her finish position, or if the ground slows down/alters the clubface through impact. Golfers can practice their wedge game for hours only to become lost as to why their proficiency with wedges has not improved. Few realize that improvement is rarely possible if the bounce, sole width, loft and heel of their wedges are not properly fit. As a rule of thumb, the less amount of mass there is on the backside of the heel the better. This works especially well when the golfer is adjusting the clubface for different shots around the green, i.e. opening the face. If you have the wrong heel grind, you could be doing everything correctly but still not getting the results you want. 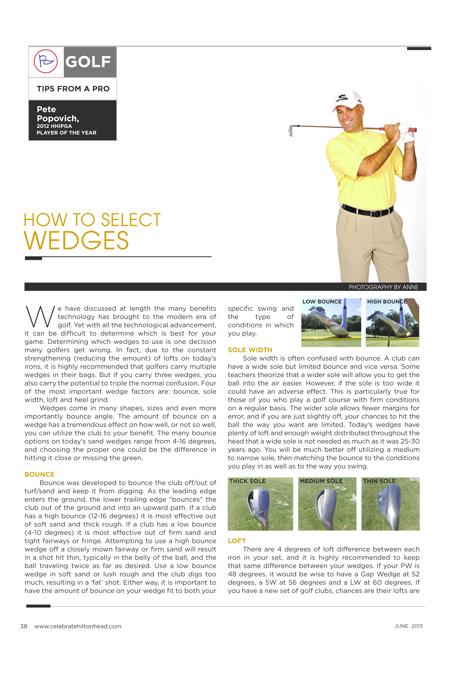 Choosing the correct wedges was once thought to be an easy task, but it was due to the minimal selection. In today’s world, there are many more options and some of these options can greatly improve your wedge game…if you choose the right ones. To learn more about which wedges you should be using, based upon your swing, playing conditions and science behind their design, contact the GPA-HHI at (843) 338-6737, by e-mail at pete@golfacademyhiltonhead.com or on Facebook at Golf Proformance Academy-Hilton Head.